I was browsing lazily through Facebook this morning, cat on lap, as one does, and stumbled across this, which is so awesome I had to share it with the rest of you. I watched this and it occurred to me that they should set up a carousel where they play *this. Because even if anyone who rides it can manage to hold it together throughout the first half, there is no one who can resist the head-banging section in the middle, and by the end, every single person would be singing along at the top of their lungs. 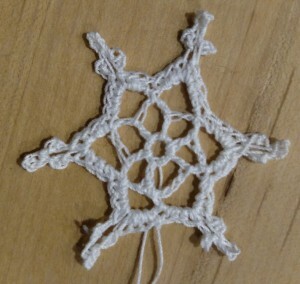 Today’s snowflake suggests that maybe, just maybe, I’m starting to get the hang of this. We shall pretend that I did not have to rip out the first point twice before I finally got it working. Shh..
Making a snowflake a day for Thingadailies.